The Footprint Path (足跡) is a connecting area full of white footprints and red tentacles. This path does not house any effect. The player can arrive to the Footprint Path by interacting with a couple of footprints in the secluded area of the Dysmorphic World, which is accessible by going between two arms sticking out of the ground in that world. That secluded area contains an aggressive Kaibutsu. After the transition, the player starts at a small area with a horizontal path, which leads to the Crowding Footprints (混雑足跡), a bigger area with a branching path. There are two paths going north, and one goes south. The rightmost north path leads to an open mouth, which teleports the player to the path leading to the Rainbow Maze. Other paths lead to tentacles, which, when provoked, teleport the player to the Opposite Footprint Path (裏足跡). To provoke the tentacles, the player has to interact with them repeatedly, until they engulf Sabitsuki and teleport her. It is also possible to provoke the tentacles by hitting them with Iron Pipe, which has a higher chance of teleporting Sabitsuki. The Opposite Footprint Path contains the same teleporting tentacles, which do not require repeated interaction to trigger the transition, a passive Kaibutsu, which triggers the Candle World Kaibutsu if hit with Iron Pipe, and the entrance to the Plant Labyrinth. Interacting with the tentacles changes the "tentacle" variable to a random number from 0 to 29. If the variable is at 29, the player will be teleported. Hitting the tentacles changes the variable from 0 to 10, and the player is teleported if the variable is at 10. Contrary to popular belief, the Candle World Kaibutsu can be triggered without interacting with the green cube in the secluded area of the Music World, where the passive Kaibutsu of the Opposite Footprint Path teleports Sabitsuki when angered. 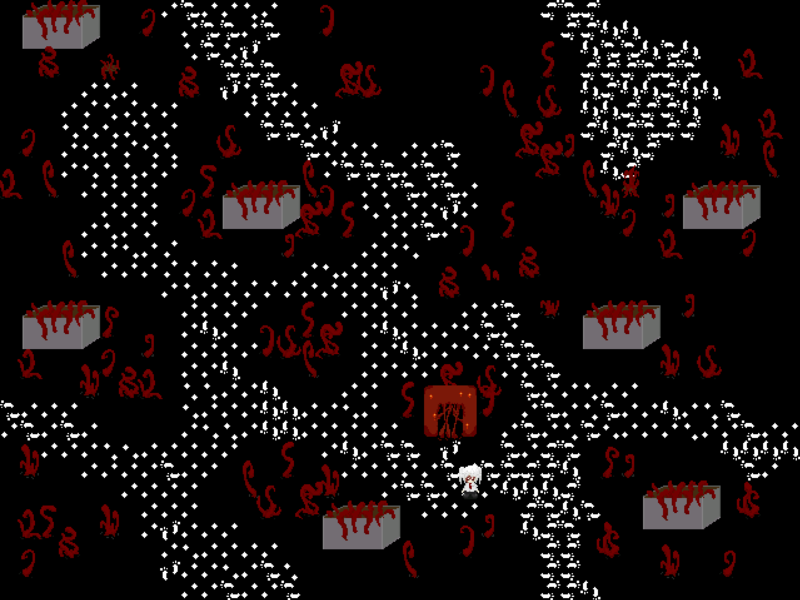 The player simply has to use the Arms effect after the transition and then go to the Blood Maze.